‘Renegades’ by Marissa Meyer – Justice or Anarchy? – you choose. Review and Download. Which Side Will You ChoosE ?? Back in November last year I read an arc of Renegades by Marissa Meyer and if you’ve known me since then, you’ll be aware of how much I freaking loved it! I am in no way a superhero fan, it’s just not my thing, so the fact that Renegades was such an amazing read for me is extraordinary. In Gatlon City, the Renegades are everything any young prodigy should want to be: fighting for justice, defending the weak and protecting the city. In short – Heroes. you can also find 2nd hand or digital editions for $5 or $6 on amazon. and barnesandnoble. For hundreds of years, prodigies spent their lives in hiding – hunted, feared and persecuted for their powers. Ace Anarchy changed all of that. He united the most powerful prodigies he could find and together they rebelled. Prodigies banded together for the first time in history. Some full of resentment, others desperately trying to find an acceptance that never came. They demanded fair treatment and human rights and protection under the law, and in some countries, the panicking governments hastened to cater to them.. but in other countries, the rebellions turned violent. 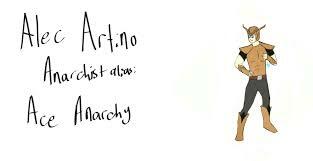 They called it the Age Of Anarchy. My decision was quite easy. 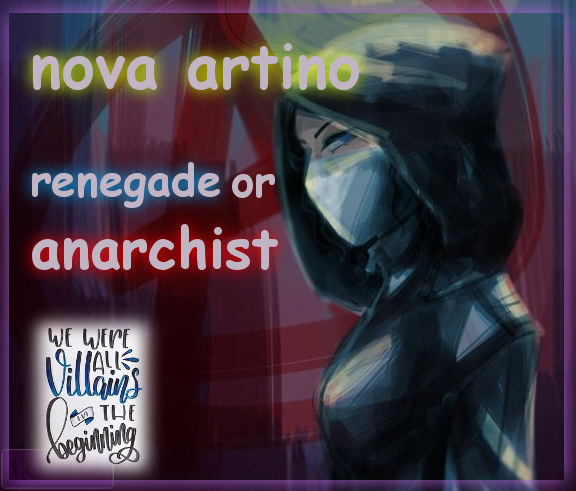 Nova is my girl and from the very beginning of the book, we learn that the Renegades didn’t keep their promise. They didn’t protect Nova’s family, but Ace Anarchy did. Nova wants vengeance and I want it for her. That might sound very bitter, but it is indeed just. The Renegades aren’t all they seem to be. 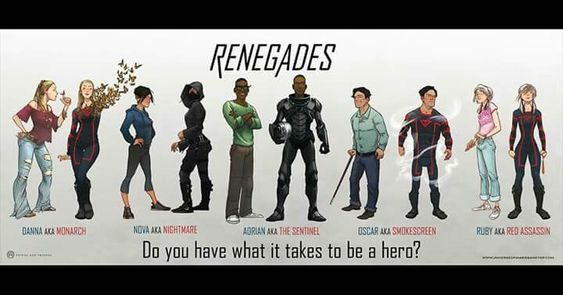 They may have wanted to protect and be genuine heroes to begin with, but as time has gone on and more and more prodigies have joined the Renegades, it’s not quite the valiant team anymore. In the story, the streets are still filled with poor people, who have crumpled houses and not a penny to their name, just trying to cling to some sort of life. The Renegades don’t quite have the same problem. The Renegades HQ building is a huge tower of glass and filled with all the luxuries you could ever want. The Renegades don’t want for anything and it’s overindulgence to say the least. They live the lives of stars, heroes upon a pedestal and the vanity is sickening. They control everything. Is this what the Renegades were meant to be? While the Renegades are free, the Anarchists are left to rot in the sewers that they call home. Scrounging for food, sleeping on make shift beds and in tents. In this right? Not in my opinion. The ‘choice’ of newborn prodigies was to submit to becoming a Renegade and live by their rules, becoming a puppet of sorts. Or be an outcast, a supposed villain, forever hunted without a choice. We were all villains in the beginning, we weren’t given much of a choice. Neither side is totally bad or totally good, which is why it might be so difficult to choose. In my eyes the Renegades were trying to help to begin with, to create a type of government and a new world without villainy. But that got lost somewhere along the way and there are many secrets being kept from the public and even from some of the Renegades themselves. I’m really looking forward to the sequel, Arch Enemies, which is due to be released later this year. 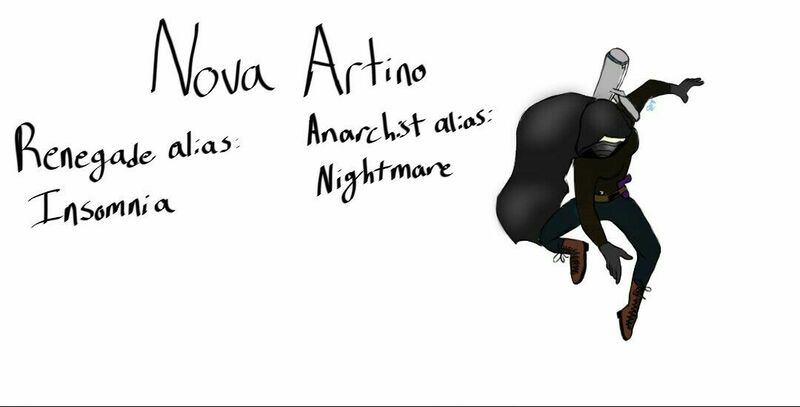 I’m excited to see where Nova and Adrian’s stories take them and how they will intertwine again. Is it too much to ask for a happy ending? Probably. I’d like to thank Lucy at Macmillan for inviting me to join and for sending out the Renegades proof and swag, you are awesome! If you’d like to read my review of Renegades you can find it here. Go get your hands on that gorgeous paperback! And let me know which side you choose?! Hi, I’ve tried to contact you on Twitter about this but you haven’t replied. I didn’t give you permission to copy my post. If you had reblogged it I wouldn’t have an issue, but you’ve blatently copied my post. Please can you take this down asap, or I will have to take this further. Thank you. I appreciate that you gave credit to Sarah’s post, but I agree with Courtney and Ash – it’s unfair to completely copy someone’s blog post when they put so much time and effort into it. If you like the post then that’s fine – but you can always reblog it or reshare it from her blog rather than reposting it entirely. Or at least ask permission first so the views get redirected to her blog? I agree with Courtney. I know you’ve linked to Sarah’s post, but you’ve copied and pasted it onto your own blog without her consent. Perhaps she didn’t want you to share it on your website? I think it’s worth being mindful of this as she puts a lot of thought and effort into her posts for her own blog, not for other people’s blogs. You could reblog it instead? That way it will link back to her original post instead? It’s not cool to copy someone’s full post to your blog. Yes you gave credit but you also get all the views and clicks. Did you even ask permission to share? You can share others work, but do it to were it leads the viewer back to there site to view and ask permission first.